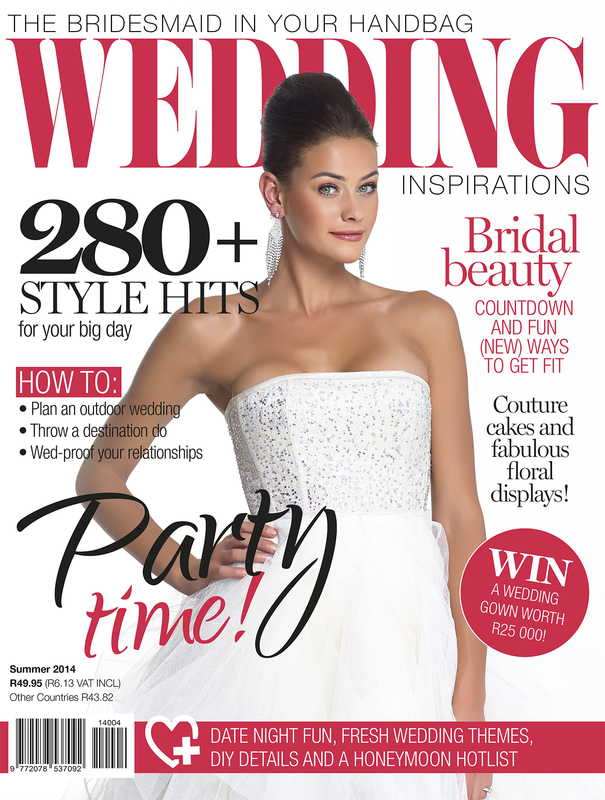 This was one of those truly memorable weddings to style. 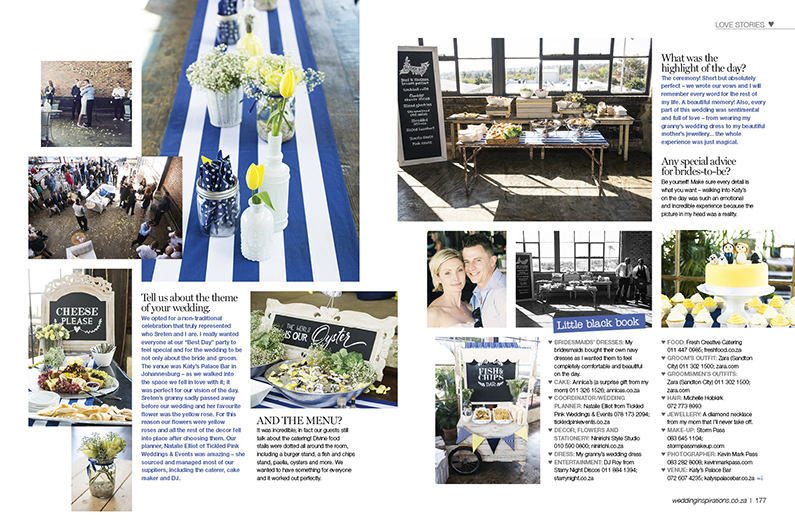 Our amazing couple – Tanya and Streten were a delight to work with as they knew exactly what they wanted and had impecable modern taste and a relaxed fun-loving vibe about them. 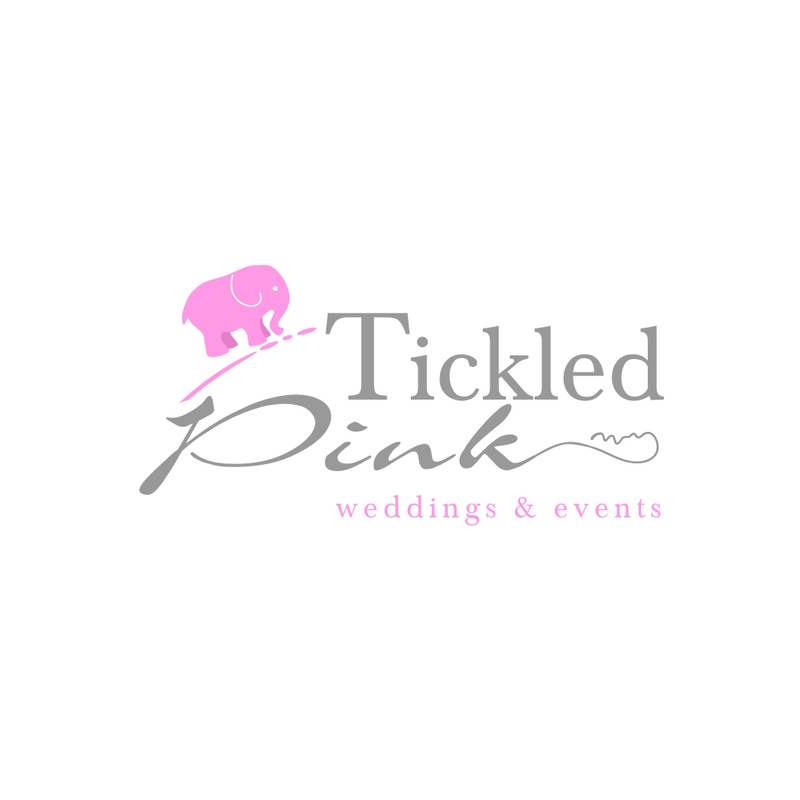 It was an honour to be appointed to style their wedding by Natalie from Tickled Pink Weddings and Events and to assist her bringing their vision to life. 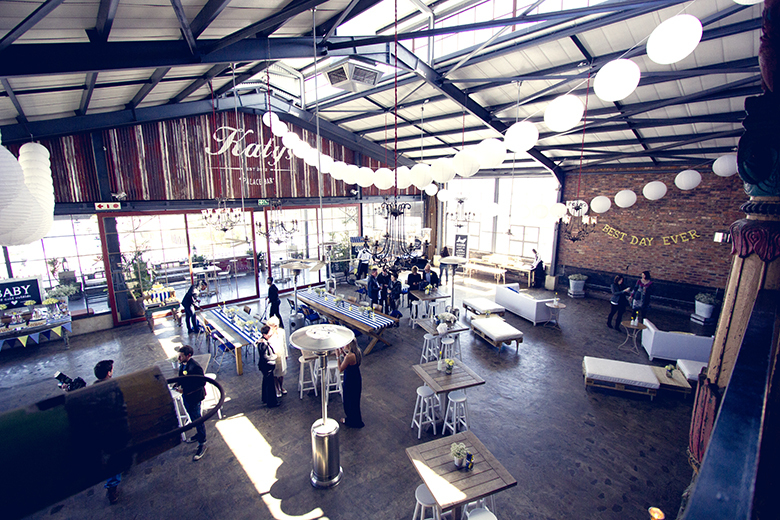 The wedding was hosted at Katy’s Palace Bar, Kramerville, Sandton, Johannesburg, South Africa. 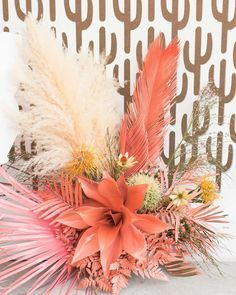 Katy’s is a rustic urban industrial space that has so much character and atmosphere – yet is a fantastic neutral pallet to dress up and customize. 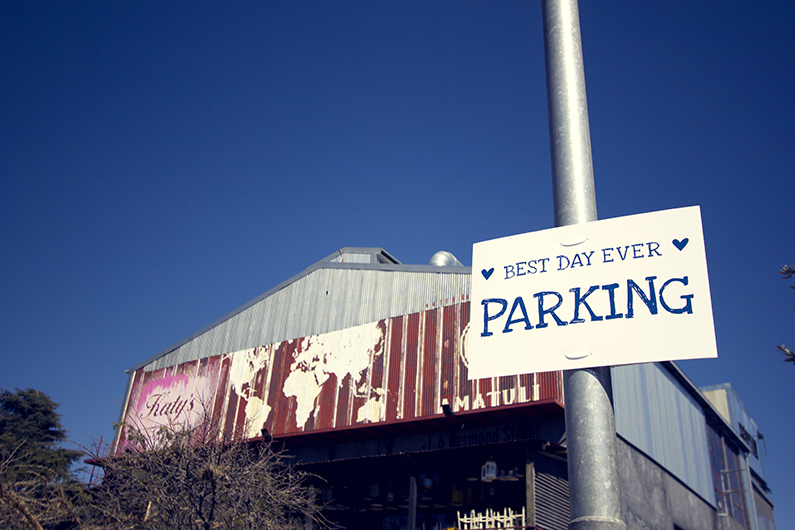 The styling started in the parking lot with customized “Best Day Ever” signage so guests knew they were in the right place. 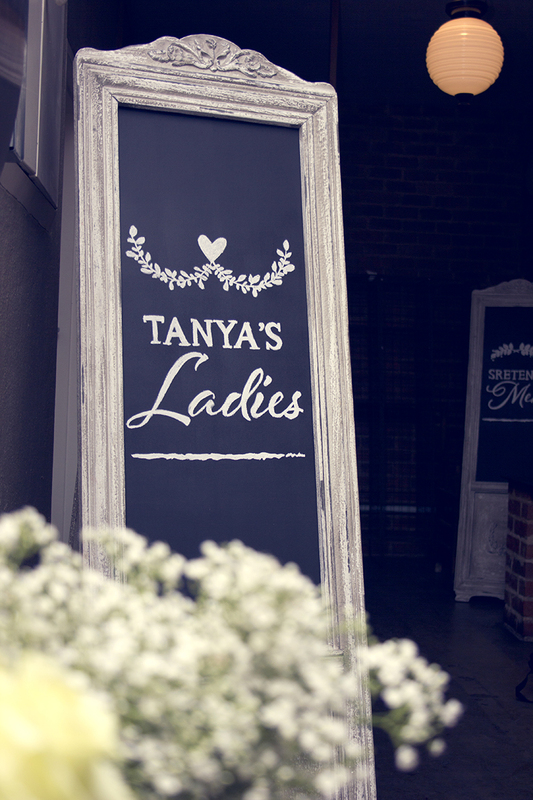 Customized signage including the couples monogram. 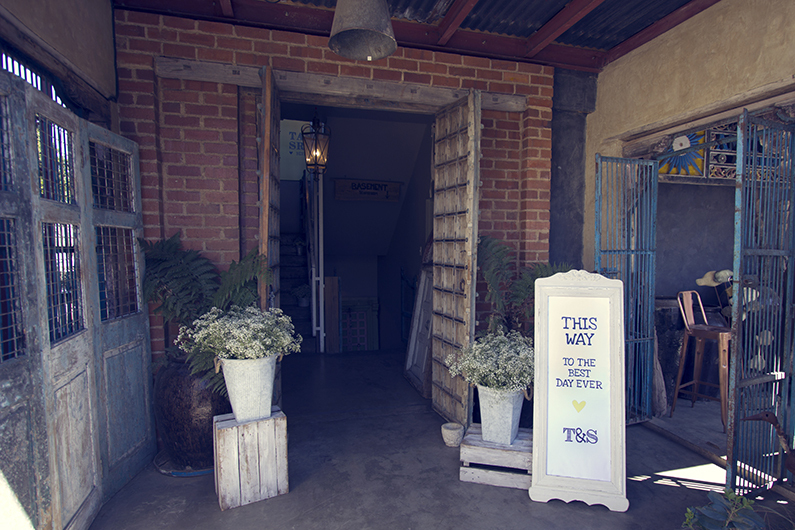 Simple floral displays at the entrance to the venue. 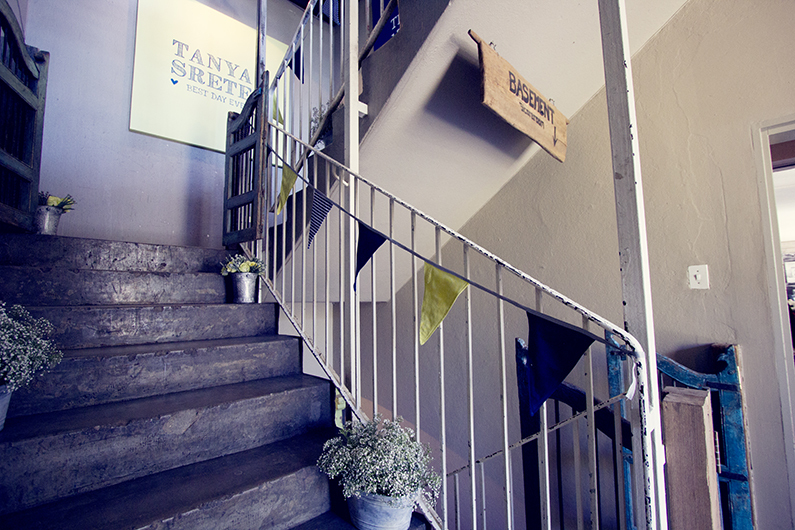 The stairs leading up to the venue were decorated with theme colour bunting, flowers in galvanized buckets and customized block mount prints. 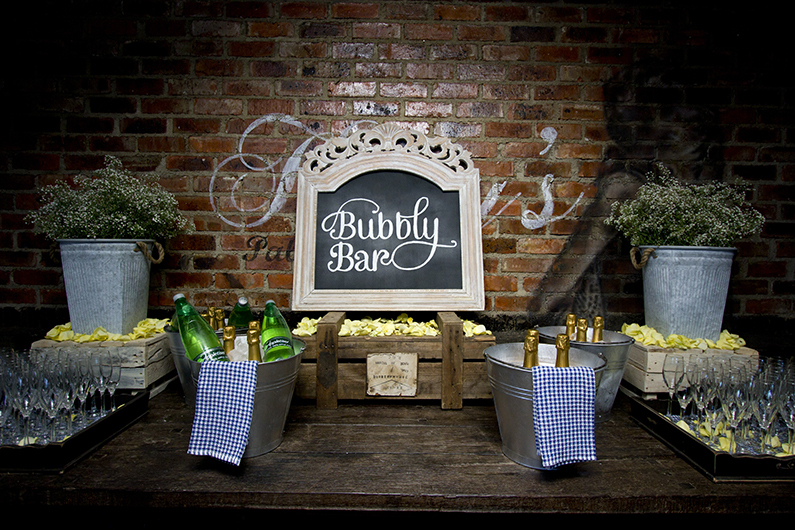 At the top of the stairs you were greeted with a glass of bubbly served off our styled bubbly bar station. 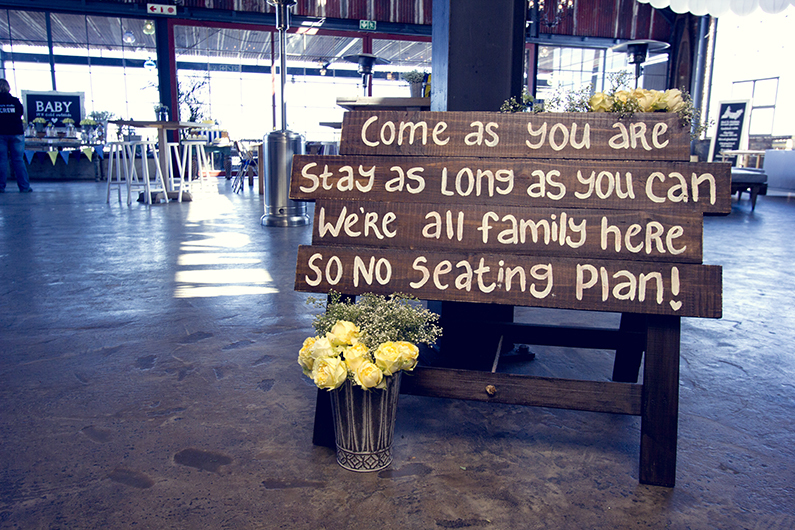 Walking into the venue you find a hand-painted rustic “No Seating Plan” board – setting the tone for an informal relaxed celebration. 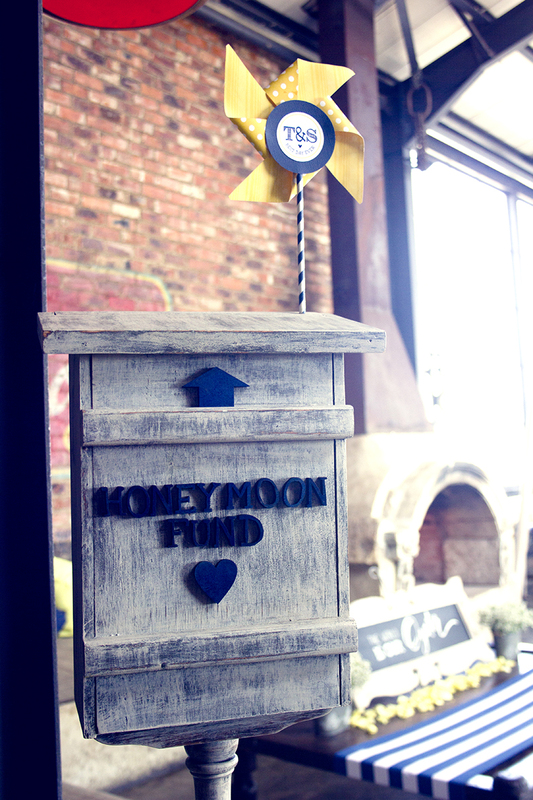 We custom-made a sweet “Honeymoon Fund” postbox for guests to pop their gift envelopes in. 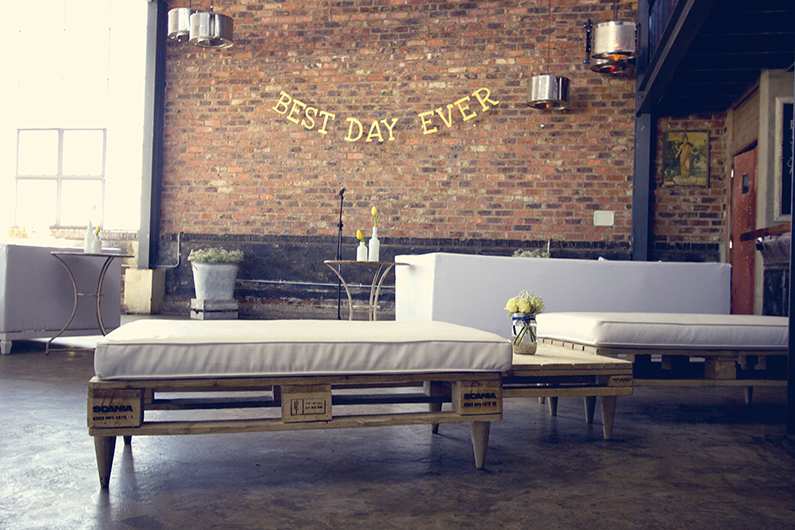 iew of the whole event space just before guests were to arrive – bridal party , photographers, decor team, organizers doing last minute preparations. 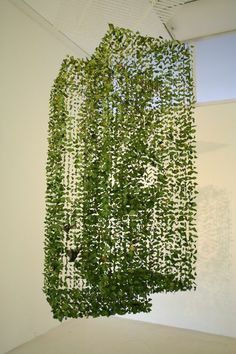 In this unconventional wedding format the ceremony was held in the same space as the reception party – allowing for a natural flow from one activity to the next. 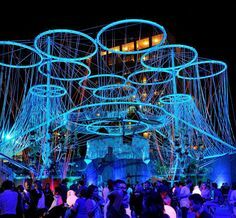 A mix of informal seating is scattered through the space and encircled by various gourmet food stations. 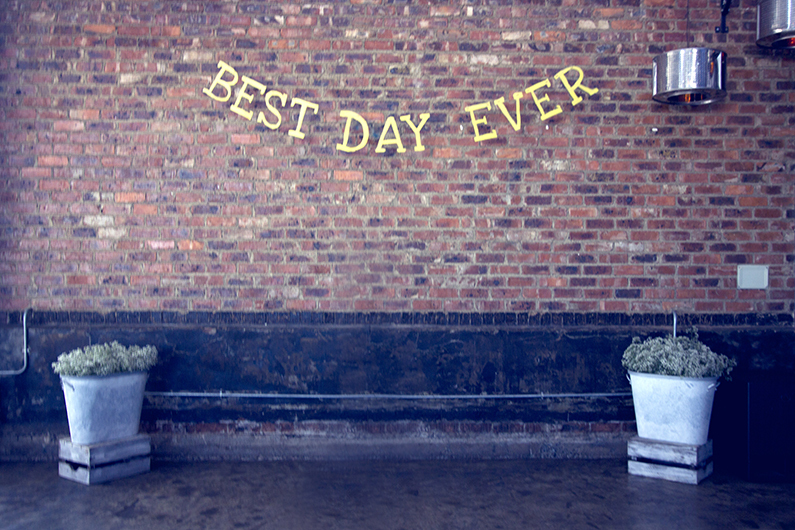 The ceremony backdrop was simple themed custom-made laser-cut bunting ” Best Day Ever” sign hung against the raw brick wall flanked by two simple floral arrangements. 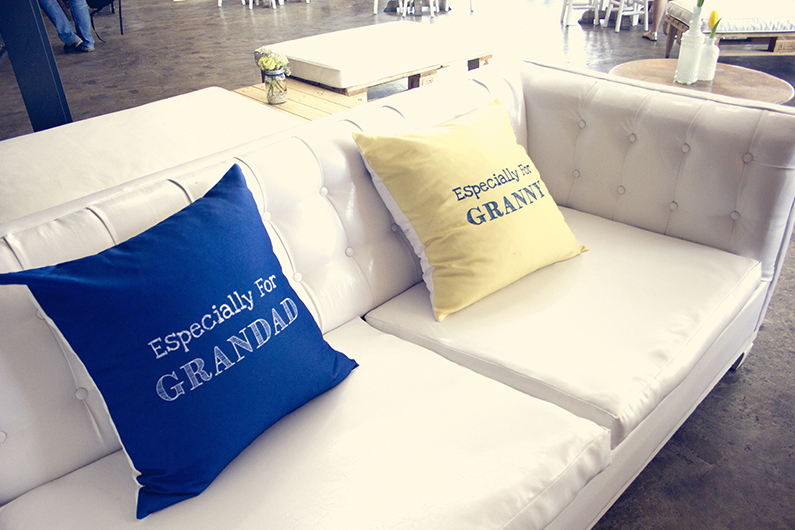 Custom-made scatter cushions for the grandparents were placed on comfortable sofa seats of honour at the ceremony. 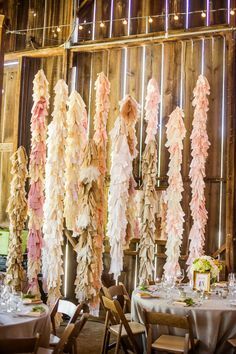 Gorgeous confetti cones – printed with the couples vows and names displayed in box crates with holes drilled to support the cones. 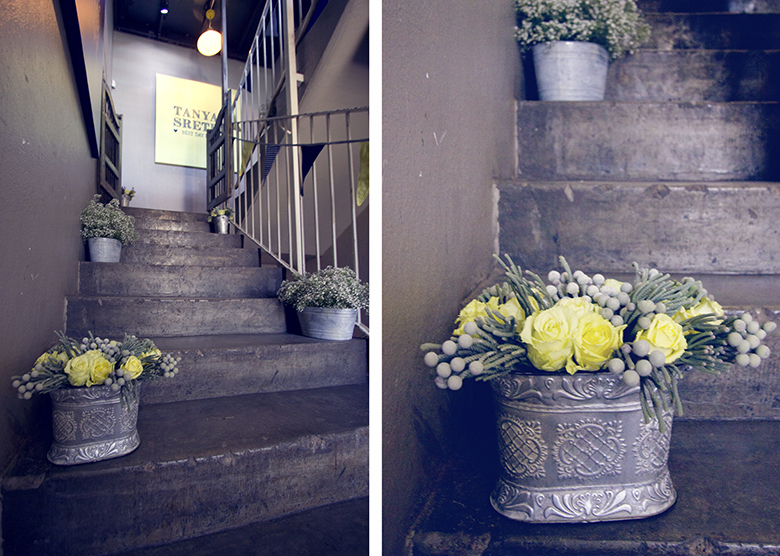 Tanya wanted to bring an element of nostalgia into the design – paying tribute to her beloved granny’s favourite flowers – pale yellow roses and baby’s breath. 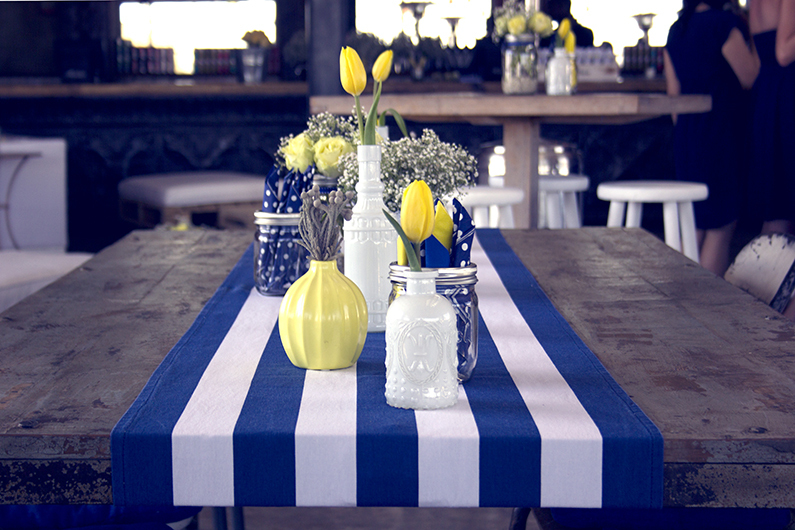 We then contrasted this soft element with bold navy blue to add a masculine element to bring visual balance and a modern touch. 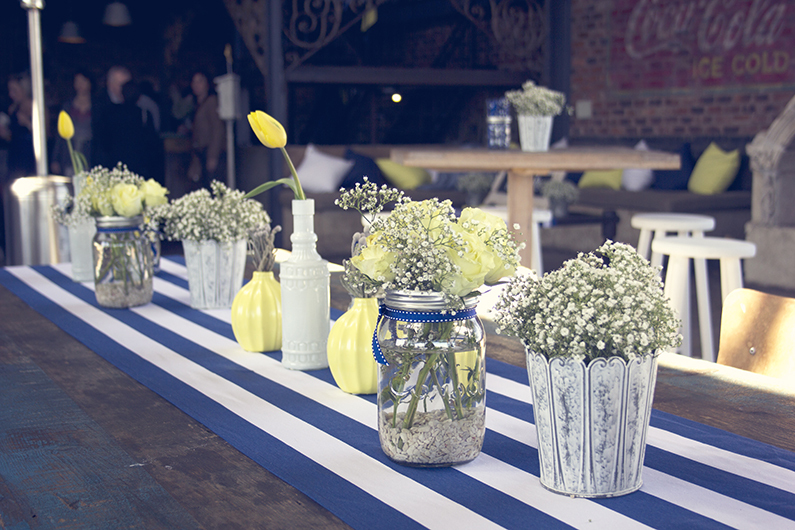 We added eclectic bud vases with tulips and fynbos for visual interest. 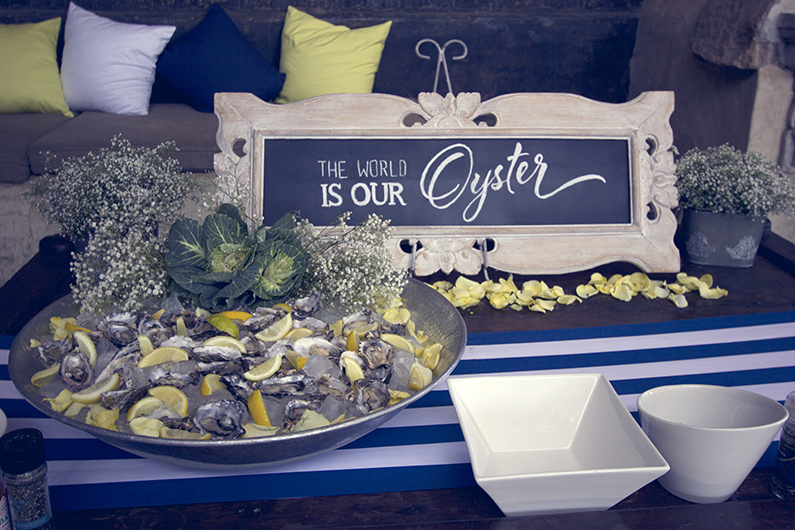 The gourmet food journey started with a fabulous Oyster bar. 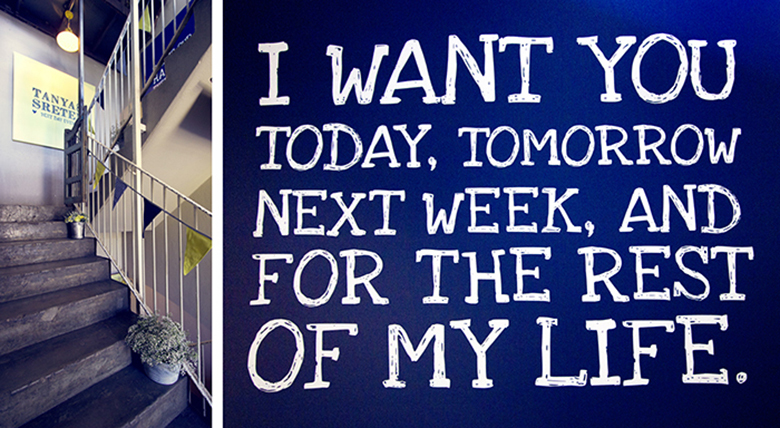 We dressed the bench in theme colour scatter cushions, a pinstripe runner and a beautiful chalk-art sign. 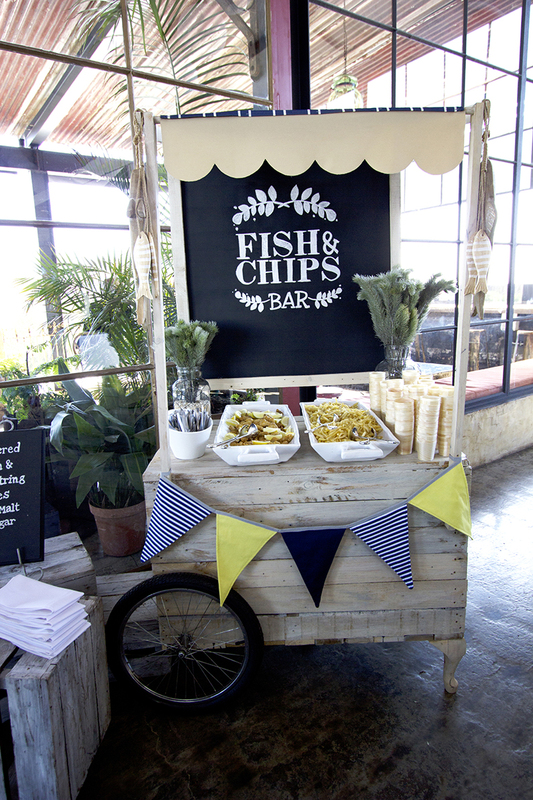 A cute pallet wood fish and chips trolley was a hit – decorated with theme colour bunting, wooden fish and chalk-art sign. 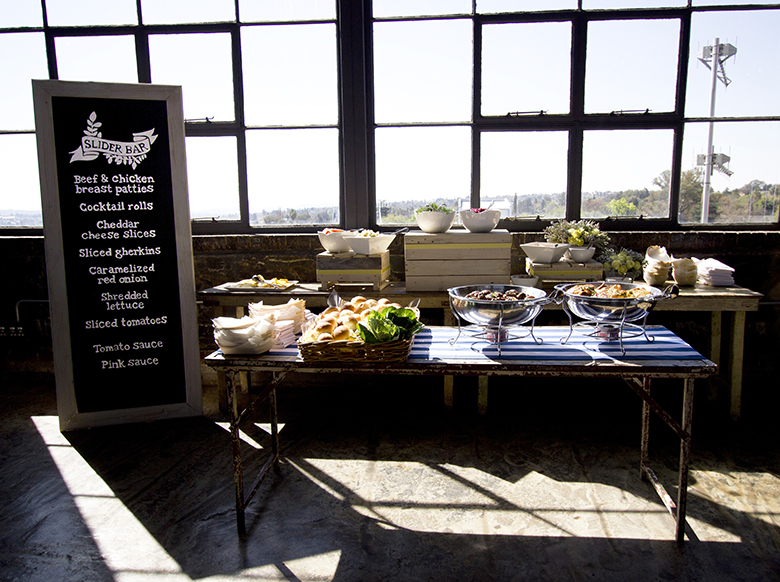 The slider bar with build-a-burger food concept display. 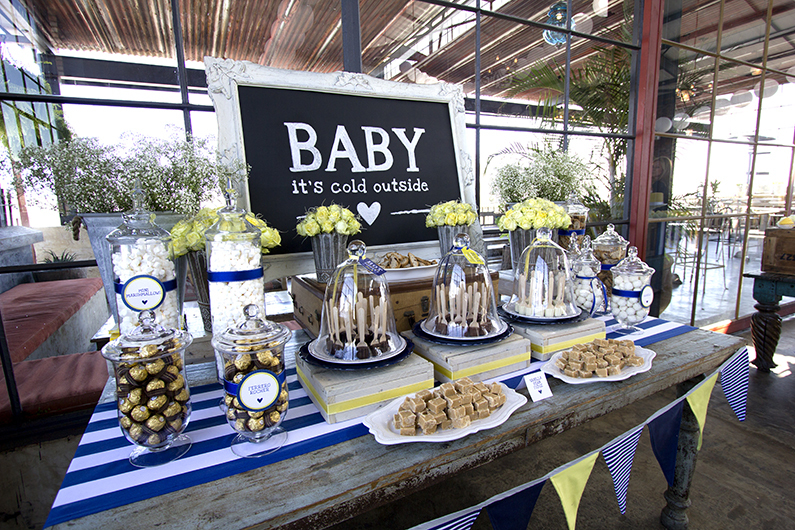 A novelty “Hot Chocolate” station was ideal for this chilly winters day wedding. 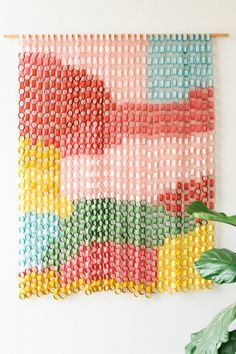 Corrugated paper cuts with dye-cut cup sleeves and customized labeling. 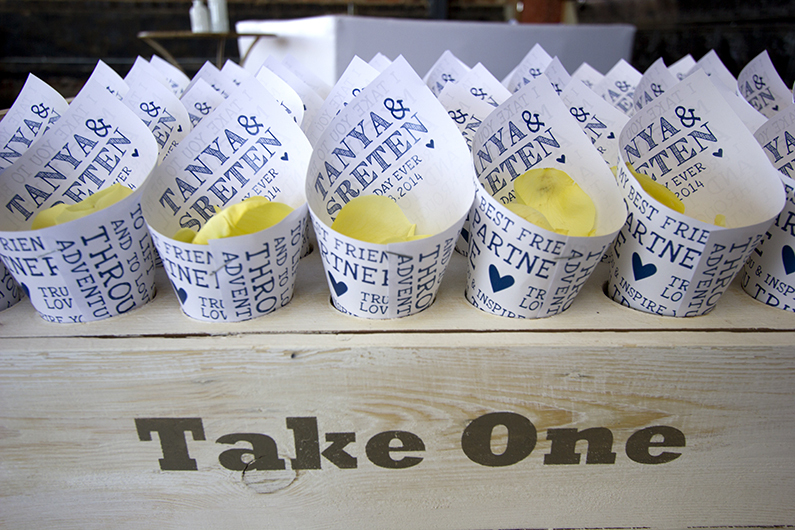 We supplied wooden chocolate spoon dippers to melt in hot milk. 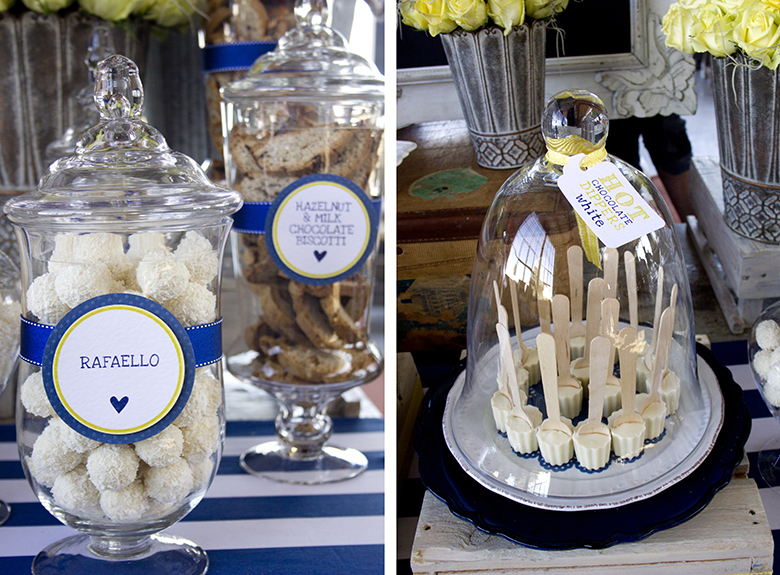 The feature dessert station – not only displayed the wooden chocolate spoon dippers under glass domes – but other luxury treats in apothecary jars and vintage platters. 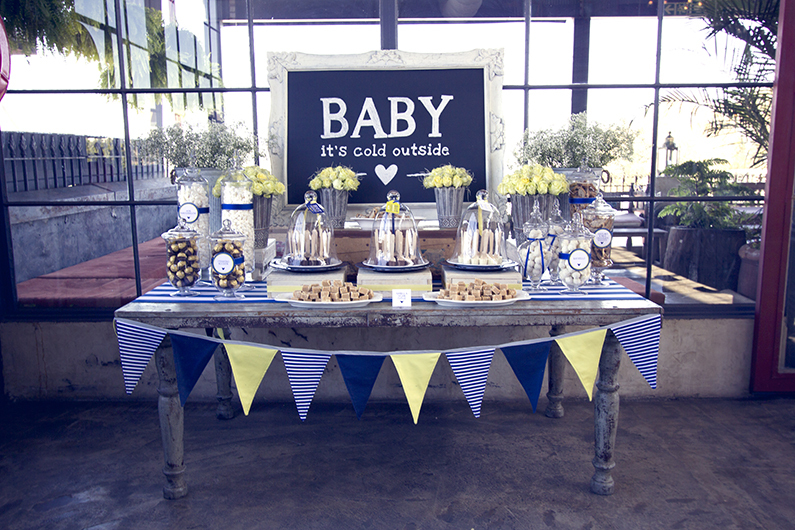 Again blue pinstripe runners, theme colour bunting, vintage wooden crates, flowers in buckets and chalk-art signage finished off the statement display. 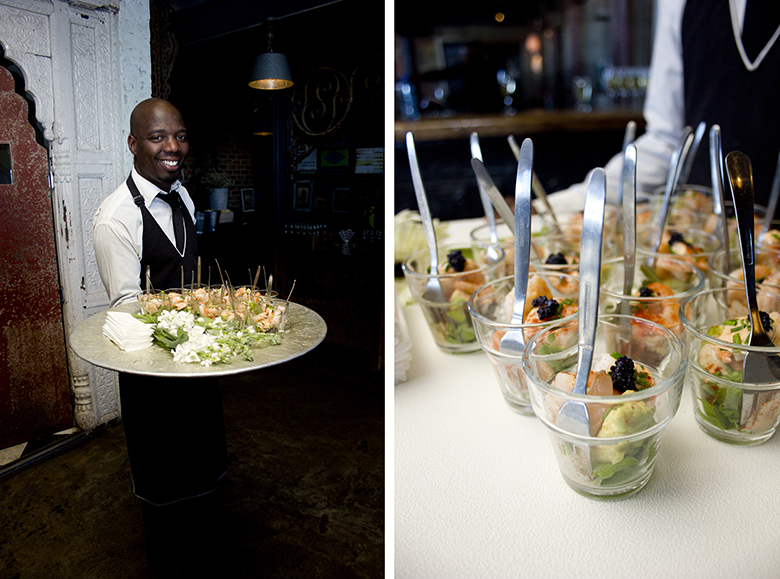 Waiters also roamed serving gourmet canapes off gorgeous platters. 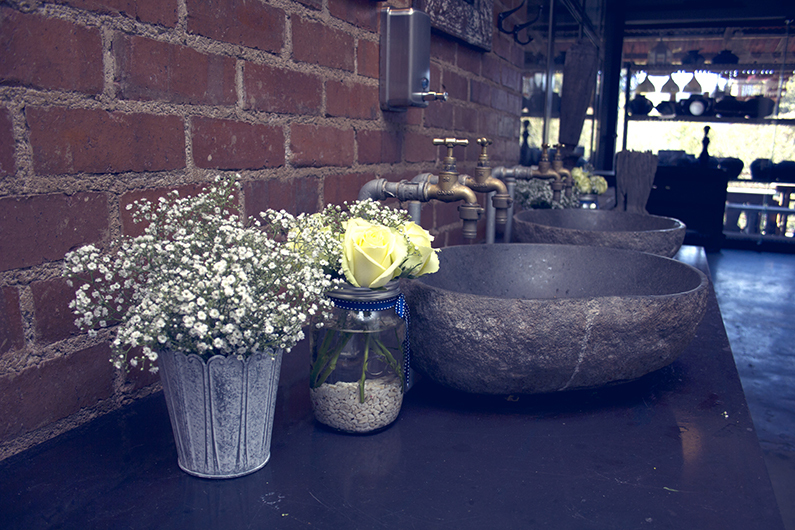 Special decor touches in the restrooms. 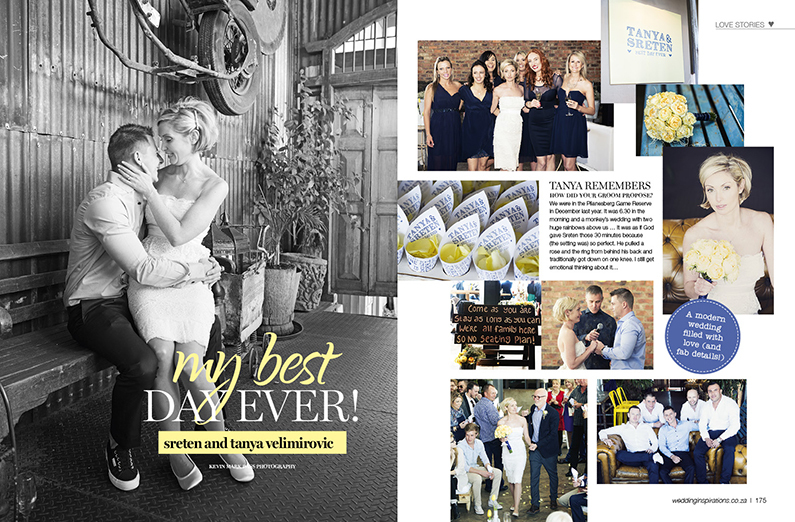 Well done to Tickled Pink Weddings and Events for organizing “The Best Day Ever” for this amazing couple.